This past weekend, while visiting friends in Pittsburgh, I went to a small, storefront museum called the Center for PostNatural History. 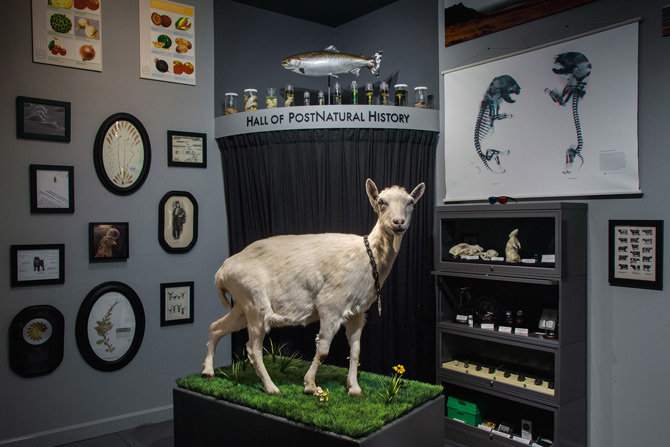 We were met by the museum’s founder and Curator of PostNatural Organisms, Richard Pell, as well as a taxidermied goat. The goat, Freckles, was one of the first of its kind to be genetically modified to produce spider silk in its milk. Spider silk, it turns out, is one of the strongest substances in nature, and producing it in larger quantities than spiders themselves can manage might have wide-ranging applications—including in medical procedures and even bullet-proof skin. Some of the other biologically-modified specimens on display—in light-up vitrines with phone receivers that play audio descriptions—include Roundup-resistant corn, ribless mice embryos, and a rat bred to prefer alcohol to water. The slightly eerie atmosphere reminded me of the Museum of Jurassic Technology in Los Angeles, and both institutions are descendants of the cabinet of curiosities-style of collection display. Both are also artworks of a sort: Pell is an artist on the faculty of Carnegie Mellon’s Center for the Arts in Society, and MJT founder David Wilson also trained as an artist. But whereas the Museum of Jurassic Technology feels like stepping into the Twilight Zone—enigmatic by design, and never quite clear about what’s fact and what’s fiction—the Center for PostNatural History seems more concerned with shedding light on aspects of the world that we have helped create, for better or worse. Fittingly, while Pell is happy to expound on each item on display, the museum itself seems less interested in presenting the many questions and moral ambiguities behind each object than it is in simply displaying their existence. In this way, the museum borrows from the “objective” presentation style and institutional voice familiar to anyone who’s been to a natural history museum. Maybe that’s what makes the experience slightly jarring, even off-putting: it feels at once familiar and new, like a variation on a theme where the theme itself is variation and manipulation. And we, the viewer, by simply being human, are somehow complicit in having brought that manipulation about. Part of what Pell says he’s trying to do with this odd, tantalizing space is to bring to the forefront things that natural history museums don’t tend to display or even collect. In fact, it was a deep dive into the collections at the Smithsonian’s National Museum of Natural History, where he noticed a lack of human-manipulated specimens, that helped convince him there was a need for such a museum to begin with. However, the field has taken notice, and Pell and his colleagues are now working directly with larger museums to mount exhibitions in their spaces, including a current one with our friends at the Natural History Museum of Los Angeles County. Which seems like a very good thing. Academics call this epoch the Anthropocene, since everything from microbes to climate has been indelibly marked by humanity’s opposable thumbprints. So for any museum concerned with our role in the world, exhibiting the post-natural is a necessary evolutionary step forward. I’d love to hear your thoughts – shoot me a note anytime!